Triple Candie is pleased to present "Proposal for an Exhibition: Unwitting Accomplices—36 Objects Thrown in Violent Incidents." 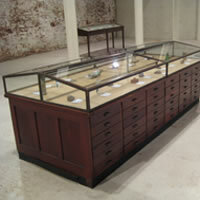 The exhibition consists of three antique, glass-topped museum cases containing thirty-four rocks, broken bottles, aluminum cans, plastic water bottles, metal, and glass fragments. 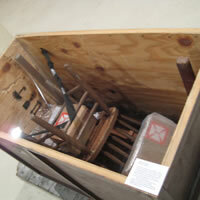 Additionally, a wooden crate, fitted with a clear Plexiglas top, contains an upside-down chair and table. 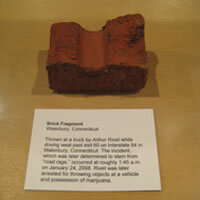 All of the objects were allegedly thrown during riots, protests, and individual acts of agrgession. 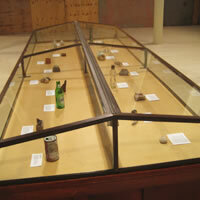 The objects are accompanied by labels that situate the objects at the center of a conflict. The stories are all true, and have been taken from news reports. They include incidents in Beijing, Budapest, Caracas, Los Angeles, Paris, Rome, and elsewhere. 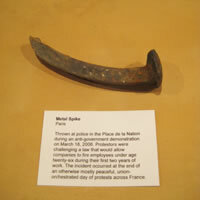 Among them is the acount of neighborhood residents in McKeesport, Pennsylvania, stoning the home of a couple accused of abusing their children; a proestor in Paris throwing a metal spike at French police during a demonstration against changes to France's labor laws; Russian Orthodox activists throwing rocks and beer bottles during a raid on a gay nightclub,; and a man in southwest Michigan throwing a table and chair at his finance during a case of domestic violence. 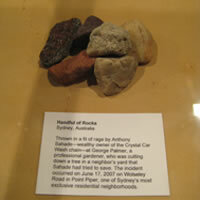 For obvious reasons, the objects on view are all surogates, which is to say that they are real objects, they just aren't the objects used in the incidents described. An acutal exhibition of that nature would be impossible to organize: one would need to be present at these sites of conflict and collect the objects thrown, and identify and interview the throwers. Thirty-four of the thirty-six objects on view were collected from the streets of Harlem. 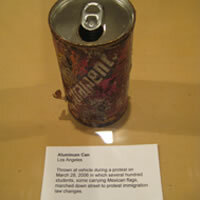 Seen in the beautiful museum cases, many of the objects—glass bottle fratments, crumpled plastic water bottles, aerosol cans; rusted, caked in durt—look oddly inert. They appear to have outlived their own histories, now entombed as specimens. Others, such as the large rocks or metal spikes—looking as if they were designed by nature to influct injury and cause destruction—are unnerving. They appear to be temporarily held at rest through their incarceration here under glass.